NOTE: This download contains ONLY the book. If you want the DVDs, you will have to order them separately. 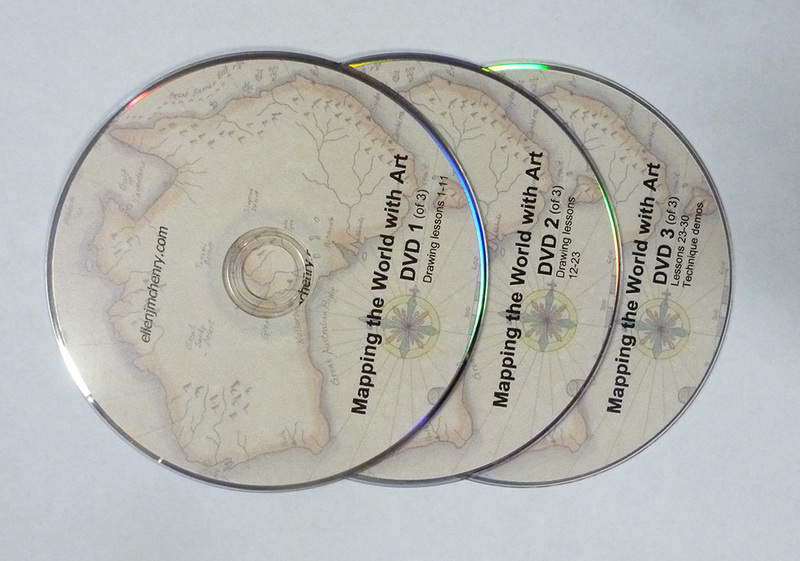 If you’d like to stream the videos, please check out the Mapping the World VIDEO ECOURSE, listed separately. The ecourse gives you both the book and the links for the video lessons. Part 1 contains 30 short history lessons. Each lesson is one double-sided page. The writing is straightforward and easy to understand and is accessible to younger students, but it does not have a patronizing “written for kids” tone, and thus is appropriate reading for older students as well. The drawing lessons and activities are based on the themes of the history lessons. The lessons start with the beginnings of cartography in ancient Greece, and end with the official discovery of Antarctica in the 1800s. Part 2 contains the drawing lessons. Each drawing lesson has step-by-step pictures that guide the student as they draw an area of the world from scratch (starting with nothing but a blank piece of paper). This method of learning is absolutely ideal for kinetic learners, but I have found it extremely effective for all types of learners. 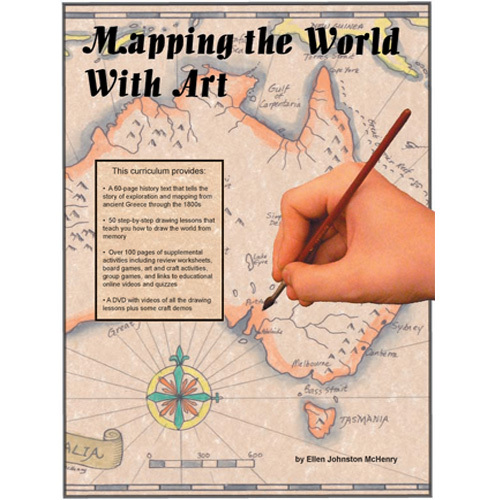 (I found it so effective that after writing “Mapping the World” I now use at least one “draw-from-scratch” activity in every subject I teach.) The drawing lessons progress in such a way that later drawings incorporate earlier ones. For example, in one of the first lessons you learn to draw the Nile River. Later, when you draw Africa, you already know how to draw the Nile. The drawing lessons tend to stay away from political boundaries, although some could not be avoided (France and Spain, for example). Part 3 contains extra activities and worksheets that go with the history lessons and/or the drawing lessons. Activities include extra worksheets for practicing what was learned in the drawing lessons, group games, board games, crafts such as making simple navigational instruments, or art projects (about maps) using paint, crayons or colored pencils. There are also many supplemental videos suggested, all of which can be accessed for free via the Internet. The videos are mostly documentaries about the navigators who sailed around the world, or brief video visits to the places the students have drawn. — How much would it cost to print out the book using my own printer? Printing out the entire book can be a bit pricey, as there are so many color pages. If you own a laser printer, you can probably print out a copy of the entire book for about 3 cents a page, which would be a total of around $10 US dollars. Copy shops may charge as much as $30 USD to print the book. And that’s not including binding. You might find that it is actually cheaper to order the paperback version on Amazon.com or BookDepository.com. — Can I just use bits and pieces of this curriculum without using the whole thing? You can use as much or as little of it as you want to. Just pick and choose what you want to use. Some people just choose the drawing lessons that are helpful at certain points in their own curriculum. (However, please note that some of the later drawings lessons do use bits and pieces from earlier ones. — Is the similarity of your title to “Mapping the World by Heart” intentional? Somewhat. My curriculum was born out of my frustration and sense of disappointment with that curriculum. I determined I could do better. I knew that it was likely that many people had experienced what I had– thinking the curriculum was going to provide real instruction and finding it did not. I had already signed up for a whole year of teaching art and geography to a large group of kids, so I had no choice but to write my own materials week by week. That’s how the book came about.